Recommended : Use JA Extensions Manager Component for upgrade. Watch video OR Follow these Steps for how to upgrade using JAEM. Note : The upgrade via JAEM is only availalbe from Preview version to latest version. Step 1Backup your files and database just in case you experience any problems during or after the upgrade. Step 2Download a copy of any CSS files, modified images, and the two language files IF you have made any changes to any of these files. If you haven't made changes, skip this step. Step 3Install the new version of DT Register for Joomla 3.x. You DO NOT have to uninstall the previous version first. Please note you should have DT Register 3.x version before moving to 4.x version. Step 4From your site back-end, go to Extensions -> Extension Manager -> Install, browse installation file and install one by one. Step 3Install the new version of DT Register for Joomla 3.x. You DO NOT have to uninstall the previous version first. Your records, events, configuration, etc will NOT be removed. Files are replaced but all data is left alone. This is actually the case whether you uninstall/reinstall, or if you simply install over top of the previous version. 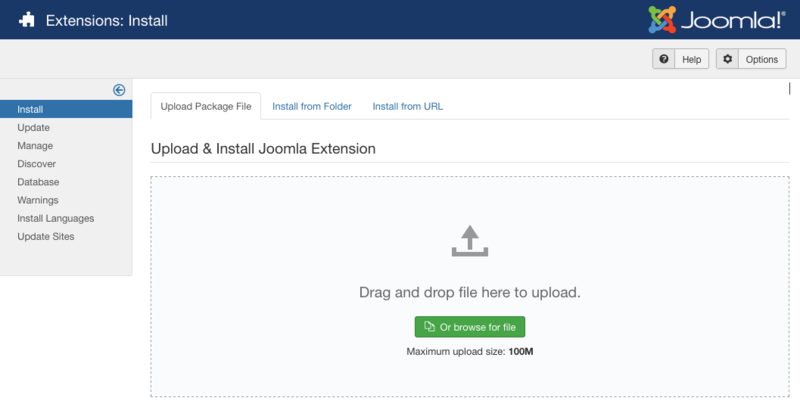 Just make sure you use the Joomla installer and NOT just manually replace files. Step 4IF you have changes in any CSS file or images, you can re-apply them to the new package installation. You can reload your backed up file, but you should always double-check to see if any changes were made in the updated version. You don't want to wipe out needed changes that may have been applied. Many changes were made with CSS in version 3.2.0 so be sure to use the new CSS files... not replace them. Step 5IF you have changes in your language files, DO NOT reload them to your new installation. There will be new language items that you will need. You will find two language files for DT Register... one for the frontend and one for the backend (administrator area). If you have previously made any changes to your DT Register language files, you will need to re-apply them to these new files or just add the new language items which are always found at the bottom of the new language files. For language changes, you should consider setting up a Joomla overrides language file to handle your modified DT Register language tags so you do not lose them in future updates. Step 6Now, you need to go to the DT Register -> Configuration, set all new parameters and SAVE. Step 7Go to DT Register -> Permissions. Make sure all items are enabled for Super User except for the first box "Edit Own Items Only". Save. You should be all set now! If upgrading from a version prior to 3.0.9, you'll need to open and re-save DT Register Permissions. If upgrading from a version prior to 3.0.8, you'll need to open and re-save any event that uses conditional fields. There is a new toggle on the fields tab within an event edit page that allows conditional fields to now be shown (and controlled) per event! So make sure each conditional field is enabled for the event as needed, then re-save. Changes were also included to the main.css file for this release so be sure to use the current CSS file. If upgrading from a version prior to 3.0.5, you'll find the Configuration area (on event listing tab) now has a Primary Ordering and Secondary Ordering. A hard-coded primary ordering by category is no longer forced. Set ordering as desired and re-save configuration. Also, if you do not re-save configuration, your date formatting will not look right due to date config changes in this release. If upgrading from a version prior to 3.0.3, you'll need to open and re-save all DT Register categories. Make sure the access level is set appropriately... and note that the Joomla access level "Guest" is NOT the same as "Public". Some users experience installation problems due to more restrictive server settings. If you are having no luck getting the install to work, the first thing to check is your PHP setting for upload_max_filesize. This must be larger than 2M as DT Register is a larger package than the average extension. You can check this in the System Info area of Joomla!. If for some reason you are unable to get this setting increased, you can use the Upload From Directory option. If you are having problems saving the main DT Register configuration, it's because something is missing that is required. Check the Emails tab (which is probably bright red) and make sure "From Name" and "From Email" are configured.